Embarkation is standard - when you check in online, you get a 30 minute window to show up. If you show up outside the window, you go in another line. Passports are check before security. Keys are in your room mailbox. Getting on the ship is much faster now. Carnival app - not sure why no other cruise has this. Has all activities on the app. What food is available. Chat with your group for $5 for the entire cruise. Can check into dining for any time dining. Maps of decks. A lot of rooms are smaller and used more efficiently. The main theater is on 2 floors instead of 3. Only some small tables on the outside. The main floor seats are like dining seats, so they can be move around based on the show needs. No tables so there are more seats in a smaller area. There is a bar in the theater. Punchliner club is smaller as well. Moveable seats with no tables. Seems like less capacity than before. Need to line up to get in. There wasn&apos;t comedy every night like other ships. Not sure if that is the new standard or because this ship has a higher focus on kids. The 2 comedians on this ship repeated shows. I&apos;ve been on other Carnival ships where the comedians never repeated a show. Water park area looked good for kids - large play area and 2 water slides - longer than avg. Theme is Dr Suess - Cat in the Hat and Thing 1/2 were on board. Skyride - like a bicycle in the sky. It&apos;s more exercise than a ride. There is one part where it is downhill on each track. There are 2 tracks - same length. 2 cars per track, so it can take a while to get on. Absolutely nothing allowed in your pockets - they have temporary lockers to put your belongings in. Skycourse - obstacle course in the sky. 2 tracks - 1 easier than the other. Normally lines weren&apos;t long for this one. Walk across an elevated course tethered to a beam above. Cabins - we had an inside cabin - they are shorter and wider now. Instead of 3 door cabinet, there are 2. from the washroom door in, the wall is on an angle so there is more room by the desk area. TVs are large 42" LEDs. Very few channels. CBS news instead of CNN. Beds were comfortable. Luggage fit under bed. Washroom same size as before. Desk has 2 usb plugs in addition to regular power outlets. Mini fridge in room. Standard safe. No more controls for speaker announcements. Shower have containers of shampoo and body wash. Shower head power is adjustable. Test water temp for kids - can be very hot. Room stewards come once a day - you can ask for 2x a day. Thermostat is electronic instead of dial. Dining - seemed liked there are more any time dining slots now. Food was excellent- as good as more expensive supposedly luxury cruise lines. Service was great. Big emphasis for servers to address you by name. For any time dining, you check in on the 5th floor by the cafe. They give you a ticket with your table and then you proceed to the restaurant. The carnival app allows you to check in on the app- tells you your table number when ready and you just show up at the entrance. Lido buffet - seating decor is much nicer now. Looks more like a restaurant. Food is no longer against the kitchen area. There are 2 rectangular areas for food. More efficient use of space. Separate area for salads, desserts. One day was chocolate day - entire area of chocolate cakes/treats. Snacks - Pizza normally has a line. have about 5 types of pizza, but mostly make cheese and pepperoni. Deli sandwiches. By the pool, there is a Mexican shop and Guy&apos;s burgers. Juice was always available - other ships they were only available at meal times. Specialty dining - seems like with the extra space they have more specialty dining. Steakhouse, seafood, Guys bistro, Sushi, Teppanyaki, Italian. There is a brewery on board. Entertainment - standard singing and dancing. Dancers and female singers were strong. Male singers were ok. The other musicians were more geared to the older crowd - little odd given the kids theme. Shops - more shops. Jewellery store was one of biggest I&apos;ve seen on a ship. Usual great alcohol deals. Candy store is about 4x bigger than other ships and has ice cream. Atrium - main 3 story atrium has your standard bar. There is a seperate area for musicians now, instead of playing on the main floor area. There is a 3 story column that is basically a video screen - images are constantly changing. There is a 2 story one in the casino. Pool area - main pool area only has 1 pool now instead of 2 - allows for more chairs and room for dancing....makes sense. the upper decks are now narrower and only have room for 1 row of chairs vs 2 on other ships. They added a pool on the 5th floor aft of ship- need to go through Havana room to get there- not sure if it is only available to rooms backing onto the pool. As the upper decks are narrower, it is an issue to get chairs on sea days. Go early. They do walk around and put sticker on unattended chairs warning they will come back and remove your towels. Some aggressive passengers will remove your towels even if you haven&apos;t been away long. Photos - finally using technology. They are available to view electronically. they ask for your cabin # when they take your picture and you can view them later for purchase. Movies - standard big screen by main pool area. Also an IMAX theater on board - $10. Casino is still smoking. The walkway goes through the middle of the casino instead of the side....so we avoided crossing on deck 4. Ventilation was poor. Kids clubs - looked great. Dr Seuss theme was nice. If I had young kids, I would go on this ship. Looked like a lot of fun for young ones. Ocho Rios - dock right by Ocho Rios beach. $3 to get in. Clean. Go to the further area - less sea grass and less people. Water sports are available. We went snorkeling out to the reef less than a mile off shore - there was 4 of us - they started at $45 each, we got it for $20 - not much out there. There is zero snorkeling on the beach. To get to the beach, hang a sharp left out of the main port gates, towards the marina. Grand Cayman - have to tender into port. Can take some time to get off ship. If you have your own tour, go early. Sit on the upper deck to get off faster. Cozumel - The port is south of the main city. They force you to go through a duty free shop that is super narrow - like rush hour in a subway. There can be up to 4 ships in at once - I think they time it so no more than 2 arriving at the same time. They have dogs smelling for food in your bags, which slows things down as well. A variety of vendors in port - seemed expensive. Don&apos;t do the jeep tour - complete waste of money - rent your own jeep and drive around - it&apos;s safe and the roads are not busy, no crazy drivers like other islands. Jeep tour takes you to a tequila place and tries to sell you over priced tequila, then to a fruit juice place charging USA shopping mall prices, except they don&apos;t have minimum wages, rent or taxes, and the lunch places charges more for water than in the USA - completely taking advantage of tourists. Beaches on the east side of the island had nice waves - not suited for kids. if you have kids, go to Chankanaab Adventure Beach Park - just take a cab, not a tour. It is just south of the port. Debarkation - we did self debarkation. Was easy and fast. Customs was faster than normal as well. Summary - if you have young kids, this is one of the best ships to go on. Otherwise, better value on other Carnival ships. Main atrium with columns that change images. 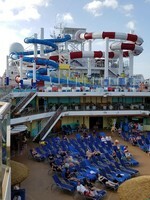 pool deck and Dr. Seuss water park. 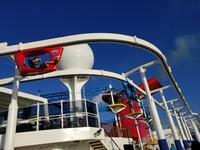 Embarkation is standard - when you check in online, you get a 30 minute window to show up. If you show up outside the window, you go in another line. Passports are check before security. Keys are in your room mailbox. Getting on the ship is much faster now. Carnival app - not sure why no other cruise has this. Has all activities on the app. What food is available. Chat with your group for $5 for the entire cruise. Can check into dining for any time dining. Maps of decks. A lot of rooms are smaller and used more efficiently. The main theater is on 2 floors instead of 3. Only some small tables on the outside. The main floor seats are like dining seats, so they can be move around based on the show needs. No tables so there are more seats in a smaller area. There is a bar in the theater. Punchliner club is smaller as well. Moveable seats with no tables. Seems like less capacity than before. Need to line up to get in. There wasn&apos;t comedy every night like other ships. Not sure if that is the new standard or because this ship has a higher focus on kids. The 2 comedians on this ship repeated shows. I&apos;ve been on other Carnival ships where the comedians never repeated a show. Water park area looked good for kids - large play area and 2 water slides - longer than avg. Theme is Dr Suess - Cat in the Hat and Thing 1/2 were on board. Skyride - like a bicycle in the sky. It&apos;s more exercise than a ride. There is one part where it is downhill on each track. There are 2 tracks - same length. 2 cars per track, so it can take a while to get on. Absolutely nothing allowed in your pockets - they have temporary lockers to put your belongings in. Skycourse - obstacle course in the sky. 2 tracks - 1 easier than the other. Normally lines weren&apos;t long for this one. Walk across an elevated course tethered to a beam above. Cabins - we had an inside cabin - they are shorter and wider now. Instead of 3 door cabinet, there are 2. from the washroom door in, the wall is on an angle so there is more room by the desk area. TVs are large 42" LEDs. Very few channels. CBS news instead of CNN. Beds were comfortable. Luggage fit under bed. Washroom same size as before. Desk has 2 usb plugs in addition to regular power outlets. Mini fridge in room. Standard safe. No more controls for speaker announcements. Shower have containers of shampoo and body wash. Shower head power is adjustable. Test water temp for kids - can be very hot. Room stewards come once a day - you can ask for 2x a day. Thermostat is electronic instead of dial. Dining - seemed liked there are more any time dining slots now. Food was excellent- as good as more expensive supposedly luxury cruise lines. Service was great. Big emphasis for servers to address you by name. For any time dining, you check in on the 5th floor by the cafe. They give you a ticket with your table and then you proceed to the restaurant. The carnival app allows you to check in on the app- tells you your table number when ready and you just show up at the entrance. Lido buffet - seating decor is much nicer now. Looks more like a restaurant. Food is no longer against the kitchen area. There are 2 rectangular areas for food. More efficient use of space. Separate area for salads, desserts. One day was chocolate day - entire area of chocolate cakes/treats. Snacks - Pizza normally has a line. have about 5 types of pizza, but mostly make cheese and pepperoni. Deli sandwiches. By the pool, there is a Mexican shop and Guy&apos;s burgers. Juice was always available - other ships they were only available at meal times. Specialty dining - seems like with the extra space they have more specialty dining. Steakhouse, seafood, Guys bistro, Sushi, Teppanyaki, Italian. There is a brewery on board. Entertainment - standard singing and dancing. Dancers and female singers were strong. Male singers were ok. The other musicians were more geared to the older crowd - little odd given the kids theme. Shops - more shops. Jewellery store was one of biggest I&apos;ve seen on a ship. Usual great alcohol deals. Candy store is about 4x bigger than other ships and has ice cream. Atrium - main 3 story atrium has your standard bar. There is a seperate area for musicians now, instead of playing on the main floor area. There is a 3 story column that is basically a video screen - images are constantly changing. There is a 2 story one in the casino. Pool area - main pool area only has 1 pool now instead of 2 - allows for more chairs and room for dancing....makes sense. the upper decks are now narrower and only have room for 1 row of chairs vs 2 on other ships. They added a pool on the 5th floor aft of ship- need to go through Havana room to get there- not sure if it is only available to rooms backing onto the pool. As the upper decks are narrower, it is an issue to get chairs on sea days. Go early. They do walk around and put sticker on unattended chairs warning they will come back and remove your towels. Some aggressive passengers will remove your towels even if you haven&apos;t been away long. Photos - finally using technology. They are available to view electronically. they ask for your cabin # when they take your picture and you can view them later for purchase. Movies - standard big screen by main pool area. Also an IMAX theater on board - $10. Casino is still smoking. The walkway goes through the middle of the casino instead of the side....so we avoided crossing on deck 4. Ventilation was poor. Kids clubs - looked great. Dr Seuss theme was nice. If I had young kids, I would go on this ship. Looked like a lot of fun for young ones. Ocho Rios - dock right by Ocho Rios beach. $3 to get in. Clean. Go to the further area - less sea grass and less people. Water sports are available. We went snorkeling out to the reef less than a mile off shore - there was 4 of us - they started at $45 each, we got it for $20 - not much out there. There is zero snorkeling on the beach. To get to the beach, hang a sharp left out of the main port gates, towards the marina. Grand Cayman - have to tender into port. Can take some time to get off ship. If you have your own tour, go early. Sit on the upper deck to get off faster. Cozumel - The port is south of the main city. They force you to go through a duty free shop that is super narrow - like rush hour in a subway. There can be up to 4 ships in at once - I think they time it so no more than 2 arriving at the same time. They have dogs smelling for food in your bags, which slows things down as well. A variety of vendors in port - seemed expensive. Don&apos;t do the jeep tour - complete waste of money - rent your own jeep and drive around - it&apos;s safe and the roads are not busy, no crazy drivers like other islands. Jeep tour takes you to a tequila place and tries to sell you over priced tequila, then to a fruit juice place charging USA shopping mall prices, except they don&apos;t have minimum wages, rent or taxes, and the lunch places charges more for water than in the USA - completely taking advantage of tourists. Beaches on the east side of the island had nice waves - not suited for kids. if you have kids, go to Chankanaab Adventure Beach Park - just take a cab, not a tour. It is just south of the port. Debarkation - we did self debarkation. Was easy and fast. Customs was faster than normal as well. Summary - if you have young kids, this is one of the best ships to go on. 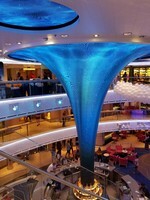 Otherwise, better value on other Carnival ships. Cabins were clean and nicely stocked. They are shorter and wider - only 2 cabinet doors instead of 3 - the one missing is the full length one. Sitting area is wider. TVs are large LED - about 42"vs 24" on other ships. Channel selection is not great. Beds were comfortable. Since the room is wider, there is more room beside the beds. Mini fridge in room. No speaker adjustment in the room for public announcements. Thermostat is electronic instead of dial. Jeep tour is a waste of money. Rent your own jeep and save money. there is only 1 road around the island and 1 road across the island. Traffic isn&apos;t bad and no crazy drivers. Jeep tour takes you to tourist traps. Rent your own and save a ton of money and annoyance. Stingray swim was good. not as many stingrays as last time. This time it was very windy and the water choppy. difficult to stand. Guides bring you a stingray to hold. Docks at Ocho Rios Beach. Hang sharp left outside port gates towards marina - follow road and entrance is on your left about 500 yards. $3/person. Go to the further half of the beach - less sea grass and people.